Lahore: Pakistan Freedom Movement, a political party registered under the ‘Political Parties Act 2002’, has been launched today with a hope to be a catalyst for action by offering themselves as the only political party in Pakistan that has a credible plan to implement evidence based, innovative, and practical solutions to challenges that Pakistan faces today. With a unique blend of Pakistan’s best experts as well as unblemished and mature political leadership, Pakistan Freedom Movement presents a brilliant team that possesses the ability to put Pakistan on the road to prosperity. 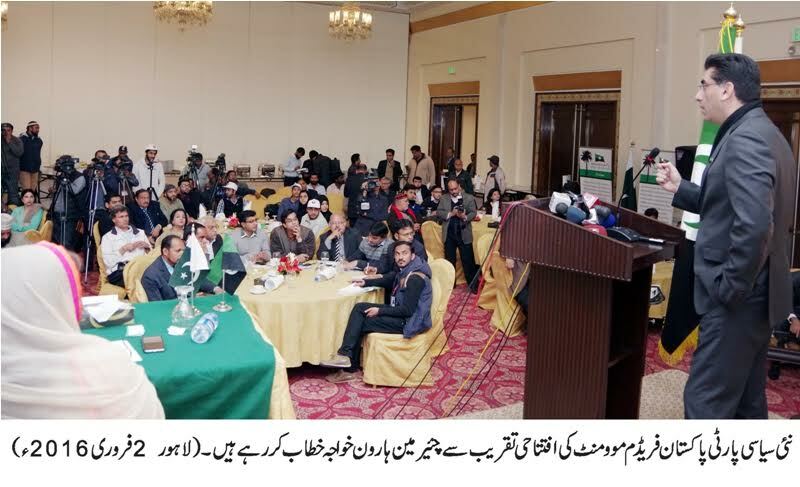 The leadership of Pakistan Freedom Movement comprises of well-respected members of civil society who have developed expertise in various fields and shown their commitment to Pakistan over the past two decades. The core team of Pakistan Freedom Movement consists of 8 such members and is headed by Haroon Khawaja as the Chairman. The work of the founding members of Pakistan Freedom Movement on different issues being faced by the country spans over two decades, Khawaja said. This work has now been carefully assembled into an impressive “Plan” that has been indigenously developed (while keeping in view success models around the world). He said that the “Pakistan Plan” revolves around ordinary citizens of Pakistan and then zooms out to ensure that decisions taken in Islamabad have a direct and positive impact on the lives of these ordinary citizens. Consequently, the Pakistan Plan connects the decision makers in Islamabad to the needs of common citizens. Further, Haroon explained that the Plan advocates that Pakistan needs to have a small but efficient government, run through sixteen ministries that are organized in five clusters (Governance, Health & Social Safety, Education, Energy &Agriculture, and Economic Development). Over the years different segments of the Pakistan Plan have been tried and tested successfully to ensure its practicability while assessing the efficacy of the outcomes. Pakistan Freedom Movement, therefore, is the only political party in Pakistan that has an indigenous, credible, tried and tested plan for Pakistan as well as a competent and professional team to execute this plan. PFM intends to initially focus on the following 14 key areas to put Pakistan on the track of prosperity and development; Pakistan Civil Service, Justice System, National Budget, Population Growth, Devolution of Power to Local Government bodies, Housing Markets, Homeland Security, Education & Skills development, Health & Social Safety, Water & Power, Food &Agriculture, Industry & Commerce, Information Communication Technology, Transport &Infrastructure. In closing, Chairman Haroon Khawaja said that according to party’s manifesto, women shall be given due representation in all economic activities; the nation shall be united by implementing provincial autonomy promised in the 1973 Constitution; accountability shall be across the board without discrimination and political victimization; the media and the judiciary will be free in letter and spirit; opposition shall enjoy the same respect as the ruling party; pride and dignity of the nation shall not be compromised at any cost; and the foreign policy shall be independent and no foreign dictation shall be entertained.